A simple lightcurve from a point source in ACIS data can be used to get an idea of the variability of the source or to look for background flares that should be filtered out. The process for HRC is similar, but requires accounting for the Dead Time Factor (DTF). 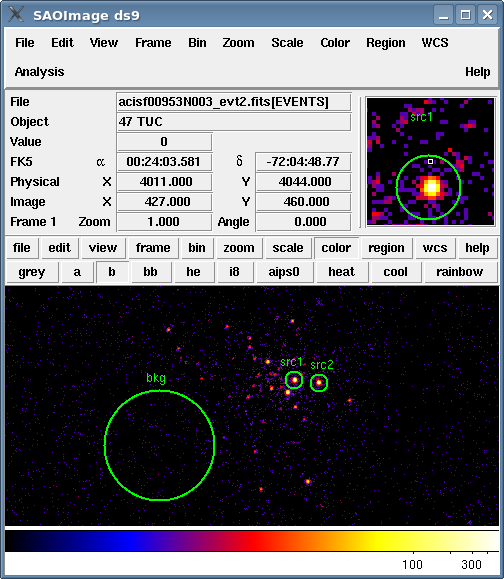 The CIAO tool dmextract is used in this thread as it accurately applies good time interval (GTI) information when creating lightcurves. To create lightcurves for use in a variety of analyses. 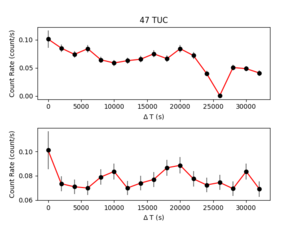 Why topic: Timing Analysis with Lightcurves: caveats that one should be aware of when doing timing analysis on Chandra data. Thread on using glvary and dither_region to look for variable sources. Last Update: 17 Jul 2017 - Updated figures to plot delta-T. Added additional links to dead-time thread. General cleanup. 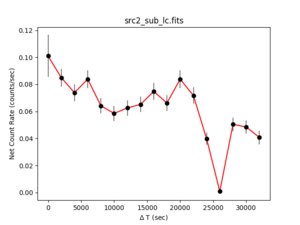 The most common lightcurve is made from a point source observed with the ACIS detector. This may be done to get an idea of the variability of the source or to help identify periods of high background. To begin, we define the regions - two source and one background - which will be used to create the lightcurves. For instructions on how to create regions in ds9, see the Using CIAO Region Files thread. The regions used in this example are shown in Figure 1. The source and background regions for creating the lightcurves. unix% pset dmextract infile="acisf00953N004_evt2.fits[ccd_id=3,sky=region(src2.reg)][bin time=::2000]"
The output file contains various columns including the time bin boundaries, source and background counts, area, as well as exposure times and net count rates. In addition, the TIME column has a coordinate system attached to it that provides the time relative to the start of the observation, DT. This lightcurve is shown in Figure 2. There is a significant drop in count rate near 26000 seconds into the observation. This information is used again in the next section. There is a significant drop in count rate near 26000 seconds into the observations. These commands produce Figure 3. 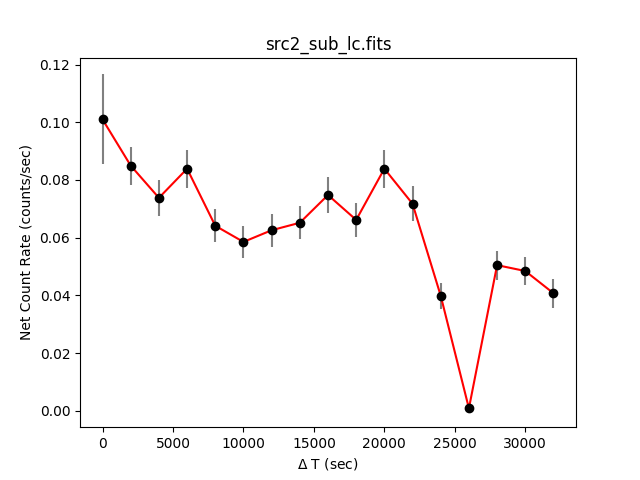 The top plot contains lightcurve "src1" and the bottom plot contains lightcurve "src2". 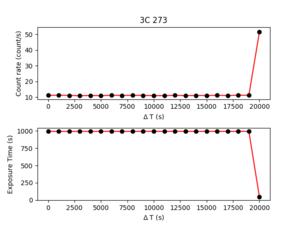 The x-axis values (time) for the two plots are aligned. This is not an instrumental effect, since it shows up in curve_2.fits but not curve_1.fits. An instrumental feature would appear in both sources, as they are close together and on the same chip. This is not a background feature, since it is present in both the subtracted (src2_sub_lc.fits) and unsubtracted (curve_2.fits) lightcurves. It is highly likely, therefore, that the dip in count rate is an indication of a variable star. In the case of 47 Tuc, this is due to a binary system; see the Chandra Photo Album entry for 47 Tucanae for more information. The technique for identifying periods of high background from a lightcurve - and subsequently filtering them out - is explained in detail in the Filtering Lightcurves thread. The proper method of creating an HRC lightcurve requires accounting for the Dead Time Factor (DTF). 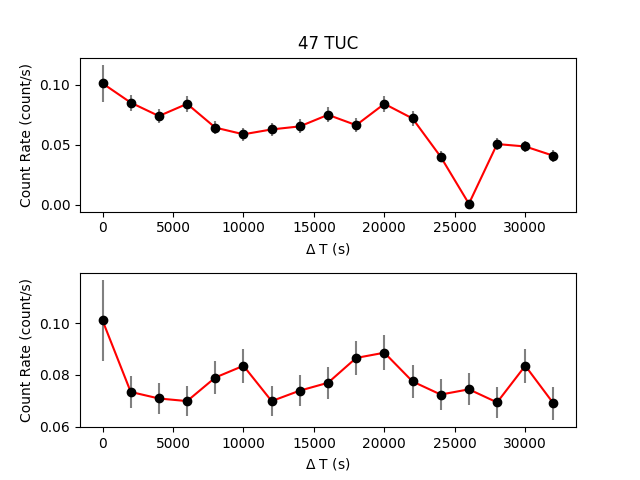 The DTF describes the detector's deviation from the standard detection efficiency. This time-dependent change is due to the physical effect of an event striking the micro-channel plate, as illustrated in the MCP Principles page. The DTF is evaluated roughly every 2 seconds and the data are stored in the "dtf1.fits" file. The average DTF value within the time bin is used by dmextract to correct the exposure time and count rate in the lightcurve. Addition information about dead times can be found in the Computing Average HRC Dead Time Corrections thread. The source region for this example has been saved in the file hrc_src.reg. Again, for instructions on how to create regions in ds9, see the Using CIAO Region Files thread. unix% pset dmextract infile="hrcf00461N005_evt2.fits[sky=region(hrc_src.reg)][bin time=64938947.367:64959159.548:1000]"
The Dead Time Factor (DTF) was included when creating this lightcurve. Note that the final time bin has a very low exposure value (bottom plot). 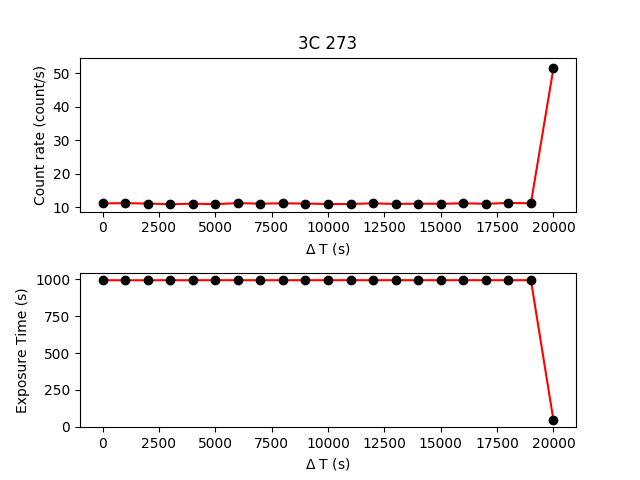 This leads to an anomolously high count rate (top plot). There are a number of subtleties that it is important to be aware of when using lightcurves for timing analysis. These issues are described in the Timing Analysis with Lightcurves why topic; please read that document before continuing with the analysis. 03 Dec 2012 Review for CIAO 4.5 ; added see also to glvary & dither_region thread. 03 Dec 2013 Review for CIAO 4.6. Added note about early data. Minor edits. 17 Jul 2017 Updated figures to plot delta-T. Added additional links to dead-time thread. General cleanup.